Target will continue to sell Apple's iPad as well as alternative tablet and e-reader devices, including Barnes & Noble's Nook, which also makes use of Android internally. The news initially leaked via an internal memo, but Target has since officially confirmed its plans to drop Amazon's products, according to a report by Reuters. The retailer's spokesperson Molly Snyder issued a statement saying, "Target continually evaluates its product assortment to deliver the best quality and prices for our guests. Target is phasing out Kindles and Amazon- and Kindle-branded products in the spring of 2012. We will continue to offer our guests a full assortment of ereaders and supporting accessories including the Nook." Reuters said Target had "declined to comment on whether closer merchandising ties to Apple or broader competition with Amazon were also behind the move to stop selling Kindles," but the retailer's continued support for the Nook underlines the friction between Amazon and other retailers. As a web marketer without a retail store presence, Amazon has long undercut both big box retailers and smaller merchants not only in price but also in its ability to sell goods to Americans without charging sales tax in most cases. US law does not compel Internet retailers to collect sales taxes if they do not have a physical business presence in a given state, an issue that has sparked controversy in many states that depend on sales taxes for their revenue as opposed to income or property taxes. Amazon's business model behind the Kindle line, and particularly the Kindle Fire mini-tablet, revolves around selling merchandise directly to customers, in direct competition to retailers like Target. Amazon is understood to make very little in hardware profits, particularly on its $199 Kindle Fire tablet. While Apple's iPad has become an increasingly important way for consumers to make purchases over the Internet, Apple is largely focused on selling its own products, and typically does so at prices that don't seek to undercut its retail partners. 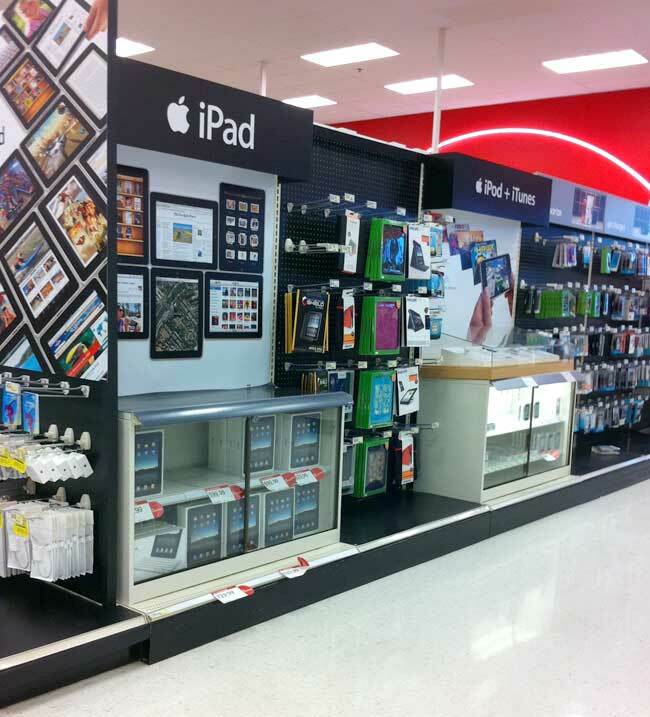 In January, AppleInsider exclusively reported that Target would begin opening a series of "store within a store" locations focused on Apple's iPods and iOS devices, including the iPad and iPhone. Target began selling Apple's iPod in 2002 and became the first retailer outside of Apple and Best Buy to carry the iPad in 2010, the same year it began selling iPhone 3GS and iPhone 4.